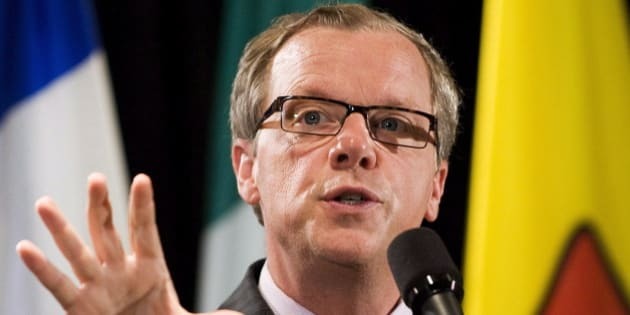 Saskatchewan Premier Brad Wall is open to using a notwithstanding clause to address his government&apos;s essential services legislation, which the Supreme Court of Canada has ruled violates Charter rights. Saskatchewan&apos;s labour legislation prohibits some public-sector employees from striking. On Thursday, Wall said he will try to recraft the legislation to conform with the court&apos;s ruling, but he is ready with a back up plan. "If it looks like we cannot do that, then the only option we would have is to use the notwithstanding clause and simply say to the Supreme Court that we want to put public safety and welfare at the foremost, as our top priority for the people of Saskatchewan," Wall said. The Supreme Court ruling gave the province one year to bring the legislation into conformity with the Charter. Wall noted Saskatchewan has already passed, but not proclaimed, a new essential services law that will be examined further to see if it satisfies the court&apos;s ruling. "We&apos;re going to look at the court&apos;s ruling with respect to our new legislation to see if we can accommodate what they&apos;re saying, but still have essential services protection for people, so that a strike or lockout does not threaten public safety or health," Wall said.